So Bootloader basically is a bunch of codes which run before the Operating system loads. It starts the booting process of a system and does all the internal stuff. You can have a bootloader which loads Android or you can have a bootloader which loads up Windows or any other operating system. Well, there are a lot of developers who can easily unlock a bootloader of a specific device but why are they locked at the first place? So manufacturers lock the bootloader so people don’t play around and mess with the stuff that you should not be. Afterall they have to provide you warranty and if you brick a device then it gonna cost them money, not you. They also do it to protect your data safety so you don’t mess up by flashing a ROM of a different device onto your device. Bootloaders are also hardware specific so there are usually no two ways to unlock a bootloader. They are all specific to the board they are running and all bootloaders are different. In the case of Xiaomi device, you can easily unlock your bootloader with their official Mi Unlock tool which allows you to unlock your bootloader within 5 minutes. Enough said about Bootloaders now before you get confused, let’s get straight to the benefits of unlocking Bootloader and also teach you how to do so. Xiaomi has made the Bootloader unlocking process of their device much easier by providing us the Official Mi Unlock Tool. The tool is developed by MIUI Community developers and allows us to unlock almost all Xiaomi devices including Redmi Note 5 Pro, Redmi 5A, Mi A1, Redmi Note 6, Mi Mix 3, Redmi Note 4 etc. The Xiaomi Mi Unlock tool will only work with Windows Operating system, so make sure you are running any Windows version from XP/Win 7/Win 8/Win 10. If you are running Linux or Mac os then the Mi Unlock tool will not work. Do note that you cannot just download the Mi Unlock tool and start unlocking your bootloader. There are a few more steps you have to follow before getting started. You can follow the Step by Step guide on Unlocking your bootloader safely. Bootloaders are locked to secure your device and prevent you from flashing wrong ROM or Kernel on your device. Normal Android users don’t care about them all but if you are already a power user and want to know the benefits of unlocking bootloader then here are the few benefits you will get. Install Custom ROMs – After unlocking the bootloader you will be able to install custom ROMs from various developers on your device. Xiaomi device comes with MIUI skin on top of Android, if you want to get rid of MIUI and try Pure Stock Android you can do that by installing a Custom ROM. Install Custom Kernels – You can install various custom Kernels which adds more function to the device and allows you to tweak the CPU and GPU so you can overclock or underclock it. So kernels provide great battery life and some kernels provide great performance. Xiaomi Locks the bootloader for various reason, one of them is when your device is stolen then the person who got it can easily change the ROM and you won’t be able to get your device back at all. While having a locked bootloader prevent the person from doing so. They must unlock the bootloader first by entering the Mi Account password associated with the device. So unlocking the bootloader is risky and you should know about what you are doing. Bricked Device – You might end up damaging your device by making changes to some part of your system. Less Secure – Unlocking a device also makes it insecure. The device becomes open and more vulnerable to viruses and malware attacks and at the end, you might lose some private data. Data loss – The first time you unlock your bootloader, All your data will be lost. The process will erase everything on your phone including apps and files in internal storage. No OTA Updates – You will also not be able to install OTA (Over the Air) Updates sent by your OEM. 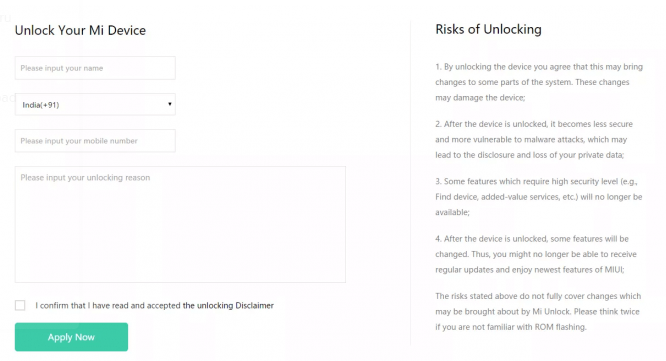 Here’s a step by step guide so you can unlock your Bootloader with the Mi Unlock tool. Also, Make sure to back up everything and try to unlock it as soon as possible so if anything wrong happens then you don’t have to start from scratch. So the very first is to Apply for Permission before you can get started with unlocking bootloader. Visit http://en.miui.com/unlock/ and log in with your Mi Account. Fill in the basic details like name, phone number and the reason for which you are unlocking the bootloader. After you apply for bootloader unlocking permissions then wait for few days for getting approval message If you haven’t got any SMS after 10-12 days then please open the page again to see whether your application is approved or not. After you get the permission for Unlocking bootloader then follow these steps. Open Settings on your phone then go to About Phone then Tap on MIUI Version 5-7 times to enable the developer option. Then, go to Settings then Additional settings then Developer option and bind your Mi account under Mi Unlock Status. Log into the Mi account on your phone which has received the bootloader unlocking permission. Then Go to Settings then Mi Account — Account security then Devices then Other devices and then remove all other devices associated with your Mi Account. Again Go to Settings then Additional settings then Developer options then Enable USB debugging and OEM unlocking. This was the last step and now your device is ready to unlock the bootloader. Let’s proceed with Unlocking the bootloader. Now open Mi Unlock tool on your PC and follow below steps. Now Login into the Mi unlocking tool on your PC with the same Mi account which received the unlock permission then Connect the device with the PC using a USB cable. On Mi Unlock tool Press the ‘Unlock’ button. The unlocking process will start and will complete in about 5-10 seconds. If this doesn’t work and you get any kind of errors then checkout troubleshoot section and figure out your problem along with the solution. In case you don’t receive any SMS about your application for bootloader unlock then you can visit here and click on the Apply button once again and it will show you the status of your application. If you see the link to download the Mi Unlock tool then it means that you have already been granted the permission to unlock your device. Then Just go ahead and download the tool and follow the instructions mentioned above. Once you get the unlocking permission for a Mi account, then please wait for 7-10 days before unlocking the bootloader. One Mi account could only unlock one device within 30 days. If your device is encrypted, the unlocking bootloader will wipe all user data. In case your application for unlocking bootloader has been rejected or if you have applied for permissions before then it gets canceled. So please try to apply again later. And make sure to input the real reason that you want to unlock your device in the comment box. Mi Unlock tool Stuck at 50% – This is the most common error faced by the users trying to unlock their bootloader. It gives an error that your account on your device and the account logged in to Mi Unlock tool is different. Make sure you are trying to unlock the bootloader after at least 10 days of getting permission. For some, it works after 48 hrs or a week but just to make sure, try it after 10 days. This is because the server takes time to update your Mi account. Developers on Mi community will manually try to update your account on their server. Couldn’t Unlock the device after certain hours – If you face this error then it means “Please try to unlock after certain hours (Hours will be mentioned on the screen) So Follow the timer/ waiting period shown in Mi Unlock Tool to successfully unlock your bootloader. USB Device not recognized – Sometimes USB device fails to detects in the fast boot mode while running on Windows 10. You can try a different data cable or try the below method. Boot into the fastboot mode by Holding Volume Down+Power button. Wait until the Mi bunny logo will appear. Then Plug the device into the computer. Unplug your device and plug it again to the computer. Again you will see that driver is reinstalling and show Android Device as Android Bootloader Interface. Once the driver finished updating it will revert back to Kedacom. Under Driver tab, click on Roll Back Driver. This might take some time and once its completed close the window by pressing an Ok button and try unlocking again. So these were some common problem and their solution. So there you go, guys the latest Mi Unlock tool. This guide will surely help you to unlock your bootloader of Xiaomi devices. Make sure to try the troubleshooting methods first if you face any error in unlocking your bootloader. Follow all the steps correctly and if you still face error then you can post your problem on the Mi Forum and the developers will surely help you out.